Edoardo Mortara (Mercedes) and Marco Wittmann (BMW) scored victories in the fifth DTM weekend of the season at Norisring. Mortara triumphed in Saturday’s race, Wittmann grabbed victory on Sunday. For each of two drivers, that was their second triumph this season. For Mortara, it’s his tenth win in a career while Wittmann collected eleven DTM wins so far. Mortara started from pole in Saturday’s race in the #48 Mercedes-AMG C63 DTM and converted his starting position into a victory. After 68 laps, he crossed the finish line with a just 0.681sec advantage over Mercedes teammate Gary Paffett. The third place went to local hero Marco Wittmann in the #11 BMW M4 DTM. For the driver who was born in Fürth, close to Nuremberg, this was his first-ever podium finish in his DTM home round at the Norisring. The race was disappointing for Audi because nobody of their driver scored no points. Their best-placed driver was Jamie Green in the eleventh place. Gary Paffet claimed the championship lead after Saturday’s race. On Sunday, there were again one BMW driver and two Mercedes drivers on a podium. Marco Wittmann won the race ahead of Edoardo Mortara and Dani Juncadella, who scored his maiden DTM podium in a career after starting the race from pole position. The race was again disappointing for Audi as their best driver Nico Muller finished in the seventh place. In the championship points after two Norisring races, Gary Paffett stayed on the top with 99 points, ahead of two race winners Edo Mortara (93 points) and Marco Wittmann (92 points). 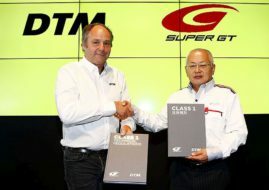 Thenext DTM round is scheduled for July 14-15 at Zandvoort.